Home » Website Building » WordPress » How to Insert Advertisements in WordPress Site? How to Insert Advertisements in WordPress Site? Why You Need to Monetize Your Website? Many online users think, reading the content in internet is free. They also use ad blockers to block the advertisements on the websites to make their experience better. However, the reality of running a WordPress website is difficult and needs lot of money. Whether you are running a WordPress site for the sole purpose of making money or just to share your ideas, you need money to maintain your site for hosting, domain, email, plugins, themes, content writing, etc. Recommended: Get discounted Bluehost hosting for WordPress site. Therefore, monetization is important for any site owner. One of the easiest way to earn with your site is by inserting ads in your WordPress posts/pages. However, inserting ads in the right position, replacing existing ones and managing their performance can be a real challenge. In this article, we will show you how to insert and manage ads in WordPress without becoming noisy to your readers. When to Monetize Your Site? As a website owner, you need to adopt the right practices to attract and retain visitors to your site. You need to publish interesting and relevant content that keeps your audience coming back for more. Fortunately, there are a variety of SEO tools that help in enhancing your visitors’ experience. Once you have established your authority in your niche, you have built a community of readers and a high number of visitors, it can be the best time to monetize your WP website. We strongly recommend not showing too many ads at the beginning which will impact the returning users. WordPress supports and encourage monetization through ads on your blog posts or webpages. This can be a good way to earn revenue to finance your hosting and domain expenses, as well as payment for your online presence. Google AdSense is one of the popular and easy ways to make money from your website. However, Google stopped the official AdSense publisher plugin for WordPress. Now you have left with using third party plugins or manually inserting ads. Out of many plugins available, we recommend using Ad Inserter plugin for monetizing your website due to the fact that it is simple and quick. Ad Inserter is a free plugin for WordPress that helps you to manage advertisements on your site. On top of saving you time when inserting and managing ads, the plugin offers a host of extra features such as Ad block detection, A/B testing and AdSense as well as Amazon ads support. Log in to your WordPress site admin dashboard. Expand the “Plugins” menu on the sidebar and choose “Add New”. Type “Ads inserter” on the search box and wait for WordPress to load a list of the available option. You can check the functionality of a plugin by clicking the “More Details” link. Choose “WordPress Ad Manager & AdSense Ads – Ad Inserter” and click the “Install Now”. After successful installation, activate the plugin to start using. Go to the left sidebar “Settings” menu and click “Ad Inserter” from the options. You can click the numbers at the top of the screen to select a block. 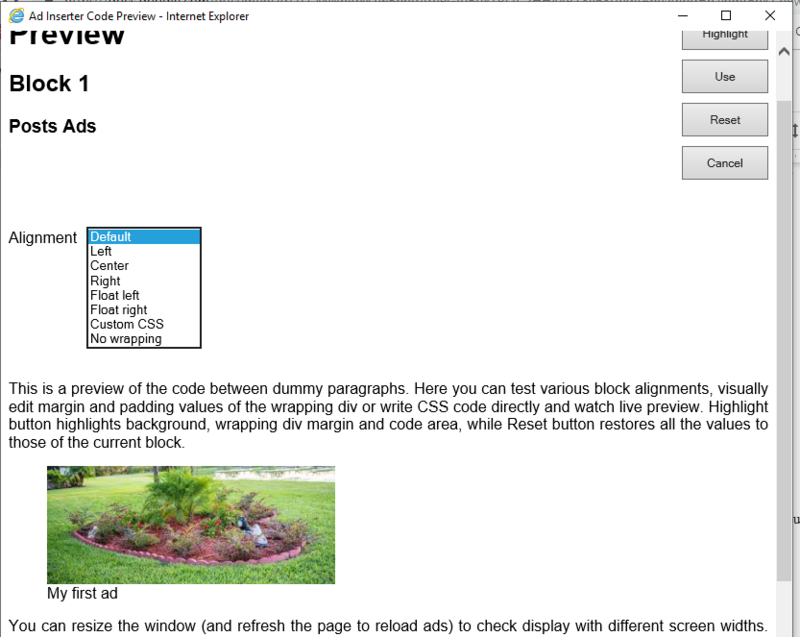 This will display the code editor for the block and the placement and target configuration at the bottom of the editor. You can insert ads anywhere on your website using Ad Inserter plugin. Click the number to select the block and click the block name to rename your ad block <Name Block.png>. Paste the ads code snippet in the code editor and save the changes. 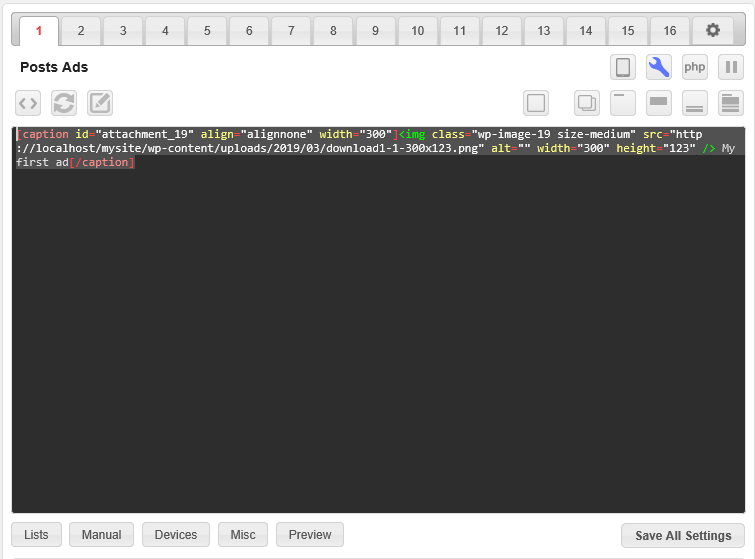 You can click on the tools icon for more options such as switching between the HTML visual and text mode. Special Offer: Get Managed SiteGround WordPress hosting just from $3.95. 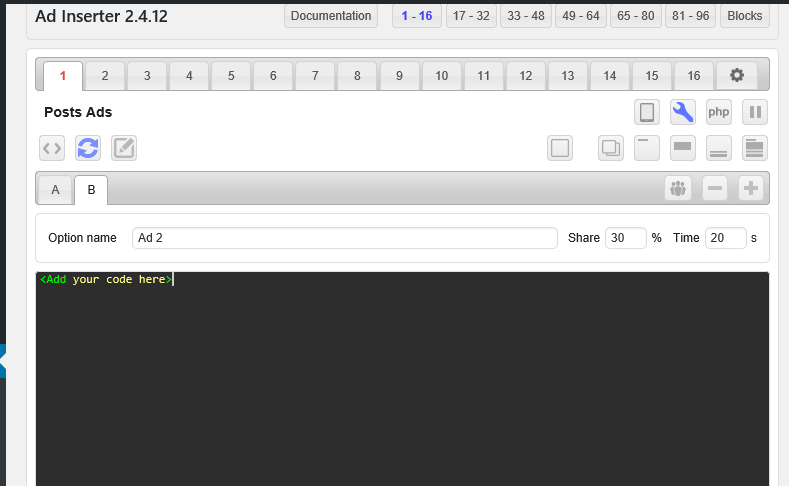 At the bottom of the code editor, you can configure where on your site and how you want to display the ad. If you want to display the ad in your post, check the box for “Posts” and leave the other option unchecked. Choose the automatic insertion position, for this example “After Paragraph 1” and for the alignment, you can select “Default”. Finally, click “Save all Settings” and use the preview button to see and modify how the ad will display. You can easily insert ads in-between content after certain number of paragrpah. For example, you can insert ads on middle of all posts by choosing 0.5 in the settings panel. Ads Rotation – This allows you to insert multiple ads that will rotate within a block. 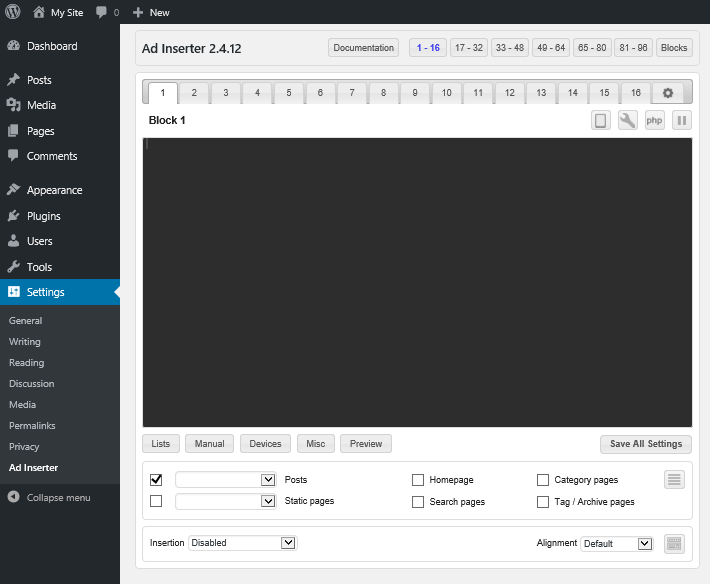 Click the tools icon at the top of the block editor and click the Rotation Editor (Icon at the middle). The ads within a block are assigned letters (A, B, C…). To add an ad, click the plus “+” sign at the top of the editor. Enter the “Option name” in the text field and assign a share of impressions to the ad, say Ad A to display 30% of the time and so on. Add the code and target settings. Exit the rotation editor and save the settings. Target Settings – Ad Inserter allows you to control your ads with content or device level targeting. Click the “Lists” button to whitelist/blacklist specific content such as tags and categories among other options. The “Devices” options enable you to limit the ad to display on certain devices, mobile, tab or desktop. With the “Misc” settings you can target specific users, schedule ads and control word count among other configurations. Google introduced many ad types for mobile users. One of the popular ads is the feed ads that will show in-between the posts on blog index, archive, taxonomies and search pages. however, implementing this in-feed ads is very difficult for normal users as you need to insert the ad code in PHP loop. You need to understand the theme function to properly insert the in-feed ads so that it appears on every “n” number of posts. Ad Inserter makes this task simple and you can easily customize the ads to show between every 3 or 4 posts in archive and index pages. You can upgrade to a pro version for €20 with the personal use plan. With the pro version, you can create sticky ads on the posts, geo-targeting and get ad blocking statistics. If you don’t like to use plugins then there is a manual option for inserting ads with limited features. You can locate the correct the place on your post / page PHP templates (generally, single.php and pages.php files) and insert the ad code. In this manner, you can showcase the fixed ads on all pages of your site without a plugin. However, you can’t rotate ads, check A/B testing and detect ad blocking. Also, you need to add the code in the PHP files every time when you update the theme. The Ad Inserter plugin offers a variety of features to any blogger who wants to include ads in their WordPress pages or posts. It is beginner and expert-friendly, with features that make inserting and managing ads easy and faster. You can upgrade to the Ad Inserter Pro version to access even better functionality such as geo-targeting, Ad statistics and many more.